North Dallas is a busy, eclectic area with many corporate headquarters, business parks, shopping malls, sporting facilitates and nightlife spots. Whether you’re in North Dallas for business or pleasure (or both), the Fairfield Inn & Suites provides a great base for your trip. You’ll be a mile from the Galleria Dallas shopping mall and a mile from restaurant row on Belt Line in Addison. Other nearby attractions include the George W. Bush Presidential Library and Museum, Northpark mall and Mary Kay Headquarters (you may want to visit the museum inside). Plus, Downtown Dallas is less than 15 miles south of the hotel. 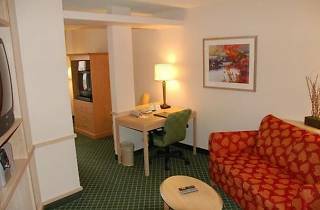 The rooms are spacious and modern, complete with standard features like a work desk, an LCD TV with HD cable, hairdryers, irons and ironing boards. 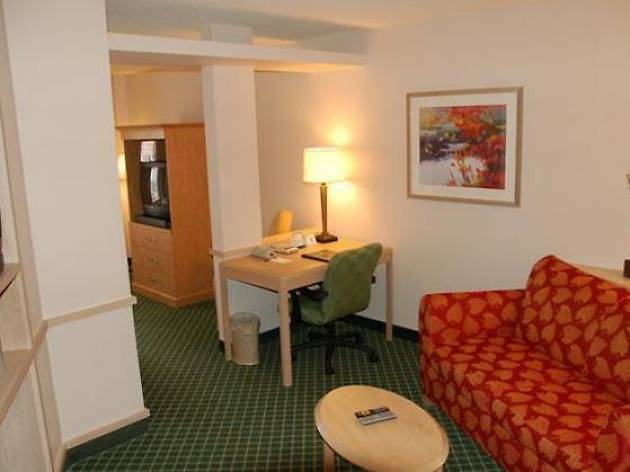 The king suites come with a refrigerator and microwave, as well as a separate seating area. Pets area welcome, however, you must pay a non-refundable cleaning fee. This hotel offers free breakfast, BBQ facilities, a fitness center, an indoor hot tub and pool, a business center and meeting facilities.